Minimal... These are photos and descriptions of my very minimal solar system. Low-cost and few parts. I encourage you to copy it and make one yourself. 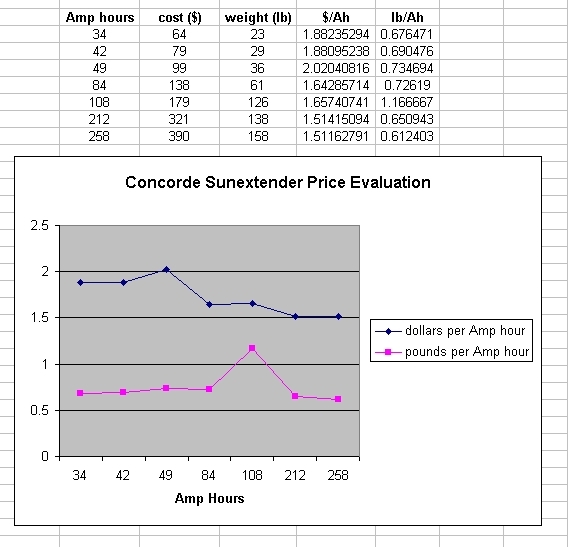 Related Spreadsheets These are design and comparison-shopping spreadsheets I've made. They mostly explore how to do solar as cheap as possible! http://www.partsonsale.com Here are a lot of low-priced solar parts-panels (special now $3.30/W), inverters, charge controllers and batteries. Jennifer was very personable. http://www.stecasolar.com/englisch/steca.htm Fancy German consumer solar equipment- charge controllers with LCD displays- good instruction manuals, inexpensive. Also a portable integrated charge controller and battery. http://cgi.ebay.com/ws/eBayISAPI.dll?ViewItem&item=2336394948&category=3240 minimal charge controller- includes low-volt disconnect. http://www.concordebattery.com/products/psb_eleclspeifications.cfm These batteries have specs well suited for Photovoltaic charging. They can be recharged many, many times. Price/Size Comparison Graph I used the current prices at www.partsonsale.com. You can see that the 84, 212 and 258 Amp hour batteries have the most bang for the buck. Avoid the 49 and 108! You may also download the the spreadsheet if you like. Expect to pay $4 per watt for photovoltaic panels. A human being can be reliably expected to generate 100-150W of power on a bicycle for several hours before exhaustion. http://www.electric-bikes.com/ Electric bicycles. A nicely laid out site you can really explore. http://www.uuhome.de/william.darden/ Deep Cycle Battery FAQ. More than you want to know!! Interactive Solar Radiation Map (sorry, US only...) Use these to estimate how much energy you can generate with solar electricity. At-A-Glance Solar Radiation Map. Use these to estimate how much energy you can generate with solar electricity. Pictures and stories from the Burning Man solar experience. back to shifty's homepage, "Transmissions From the Garage"